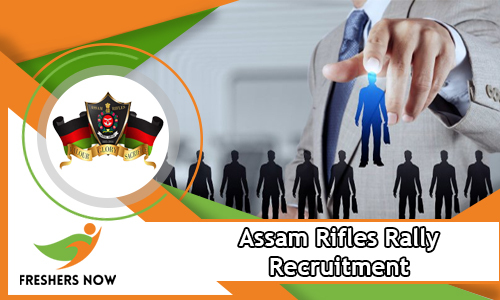 Officials of Office of the Directorate General Assam Rifles issued Assam Rifles Rally Recruitment 2019 Notification recently. And through that advertisement, the officials clearly stated about hiring the eligible people for the available Technical, Tradesman Vacancies. So, if you are interested in this job then check the total details about it. Apparently, there are a total of 749 Positions available. Now, if you have enough qualification to work as the available Vacancies, go ahead and apply for this recruitment by submitting the application form by the closing date. 14th January 2019 is the deadline to submit the application form. So, now go ahead and check all details. Aspirants have to finish their 10th or 12th From any recognized institute or University in India. Along with the Educational Qualification, contenders have to possess the correct age too. Applicants age must be between 18 years to 23 years. Go ahead and check the official site of the Office of the Directorate General Assam Rifles at assamrifles.gov.in. And if you are eligible, fill the details. And then submit the application form before the closing date. Hope all the details we provided about the Assam Rifles Rally Recruitment 2019 is helpful. Check more other Helpful articles on our site Freshersnow.com. Assam Rifles Rally Recruitment 2018-2019 Notification has released by the officers of Office of the Directorate General Assam Rifles on 30th March 2018. If applicants belong to Assam State, then apply for the Assam Rifles New Vacancy 2018 before the last date 27th April 2018 through offline mode. The Assam Rifles Recruitment 2018 Notification for 213 Soldier General Duty, Clerk, Personal Assistant, Radio Mechanic, Armourer, Electrician, Nursing Assistant, Female Attendant, Cook, Male Safai, Washerman, Barber, Equipment Boot Repairer, Tailor Posts. Therefore, the job seekers know the information about eligibility criteria details first and then apply for the vacancies. For that reason, we had provided complete details about Eligibility Criteria in a detailed manner. Therefore, candidates can check the complete article without any interruptions. Aspirants can utilize this opportunity and apply for the Assam Rifles Rally Recruitment 2018-2019 Notification before the due date. All the candidates have to know that to get the job in Government Sector is very difficult. So applicants need to do more hard work after applying for the Assam Rifles New Vacancy 2018. For the sake of applicants, we had provided this article with latest updates about Assam Rifles Recruitment 2018 with a neat explanation. So candidates can check this article until the end and gather complete details about Education Qualification, Age Limit, Salary Details, Selection Process, Application Fee, etc. For the convenience of aspirants, we had framed up all the details about Assam Rifles Rally Recruitment 2018-2019 Notification in the above table. Therefore, applicants can check the table carefully and note down all the details about the Assam Rifles New Vacancy 2018. Contenders can submit the application form in offline mode. For that reason, we had provided the address of the Office of the Directorate General Assam Rifles at the end of the article. Therefore, candidates can download the application form and post to below-given address. Contenders ready to apply for the Assam Rifles Rally Recruitment 2018-2019 Notification of 213 Soldier General Duty, Clerk & Other Vacancies then complete your 10th/ 12th/ ITI from a recognized Board/ University. In the below section, we had mentioned the post wise education qualification in a detailed manner. The Age limit also lies between 18 years to 40 years for some posts and 18 years to 38 years for other posts. Therefore, candidates go through the complete article and know details about Assam Rifles New Vacancy 2018. Aspirants who had applied for Assam Rifles Rally Recruitment 2018-2019 Notification those candidates must face the Physical Efficiency Test, Trade Test, and Medical Examination selection rounds. Therefore, contenders can know the details about selection process by checking the Assam Rifles Recruitment 2018 notification clearly. Participants stay tuned to our web portal of the official web link of the Office of the Directorate General Assam Rifles to know latest updates about this article rather than this information. 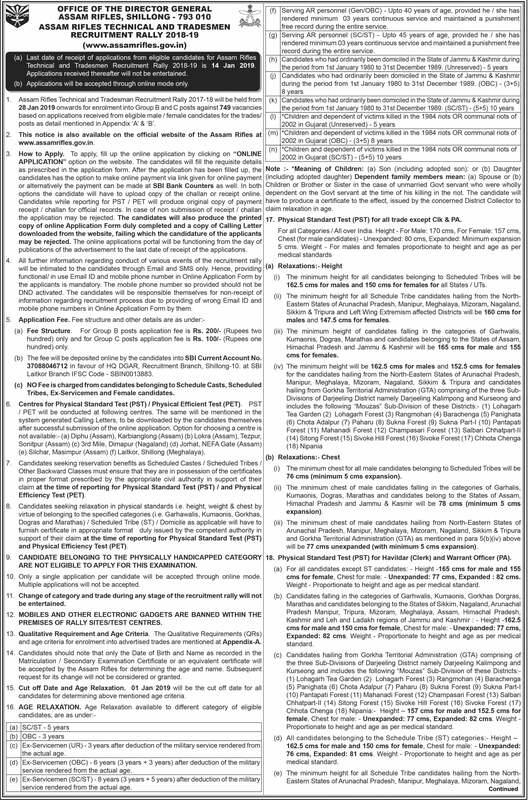 Soldier General Duty, Armourer, Nursing Assistant, Female Attendant, Cook, Male Safai, Washerman, Barber, Equipment Boot Repairer, Tailor: Aspirants ready to apply for these posts, then you have to complete 10th Class from a recognized Board. Clerk, Personal Assistant, Radio Mechanic: Should Pass 10+2/ Intermediate with minimum qualifying marks from a recognized University/ Board or equivalent. Electrician: Contenders must qualify in 10th Class and possess Industrial Training Institute (ITI) Certificate in Grade. The selection contains Physical Efficiency Test, Trade Test, and Medical Examination rounds. The Minimum Age Limit and Maximum Age Limit are different for all the posts. Based on the post wise Age Limits are given in this section. To know about Age Relaxation can check the official notification once. Selected candidates can take attractive Pay Scale along with Grade Pay from the officers of Office of the Directorate General Assam Rifles. Applicants can check the Assam Rifles Openings 2018 Official Notification once. In that notification, the authorities clearly explain the details about Application Fee. Now, visit the official web portal of the Office of the Directorate General Assam Rifles @ assamrifles.gov.in. Click on the Assam Rifles Rally Recruitment 2018-2019 Notification link which is display on the home page. If you are eligible for any one of the posts, then download the Application Form. Therefore, fill all the fields on the Application Form and attach required documents to the Application Form. After completion of the Application Form filling, aspirants can submit the application form to the official address of the Office of the Directorate General Assam Rifles before the last date. The Office of the Directorate General Assam Rifles official address is mentioned below. Laitkor, Shillong, Meghalaya – 793010. Visit our web page Freshers Now regularly to know latest updates.